One aspect that has repeatedly struck me as I reflect back on my experiences of the 2014 CBF tour was the sensory elements of the tour. Now, I do not just mean French cuisine, which was definitely a highlight. I will never forget my first French baguette, or my first shot of Calvados. Some of my most memorable moments occurred in quiet conversations about the cemetery we had just visited during our roadside picnic lunches and in “louder moments” at group dinners (singing on the patio of a French restaurant will remain a cherished memory). When I speak of the “sensory elements,” what I am also referring to is how the trip gave me further understanding of the histories I had read through engaging my five senses. Some historians are better than others at explaining or re-creating the past in such a way that readers can imagine themselves in the situation, event or moment being discussed. Even with these skilled historians, the written format that academic historians still rely on as their primary means of communicating is very limited in engaging in the senses. 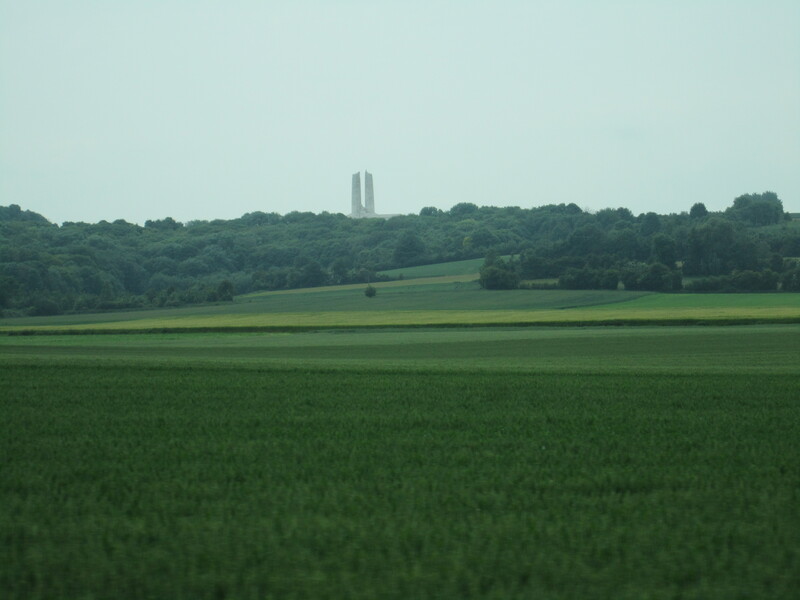 For instance, written descriptions and even photographs of the Canadian National Vimy Memorial Park that I had looked at prior to the trip did not prepare me for my first sight of the Vimy Monument. 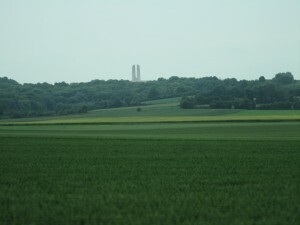 In fact, my first sight of it was kilometres away as the tour drove along the roads leading up to it. Nothing could have prepared me for how it dominates the landscape (on a side note, I had a similar reaction to see the Brooding Soldier at St. Julien Memorial that commemorates Canadian’s participation in the Second Battle of Ypres). It was truly awe-inspiring. A part of the visit saw us go into the tunnels. The tunnels had been widened from what the soldiers would have faced. 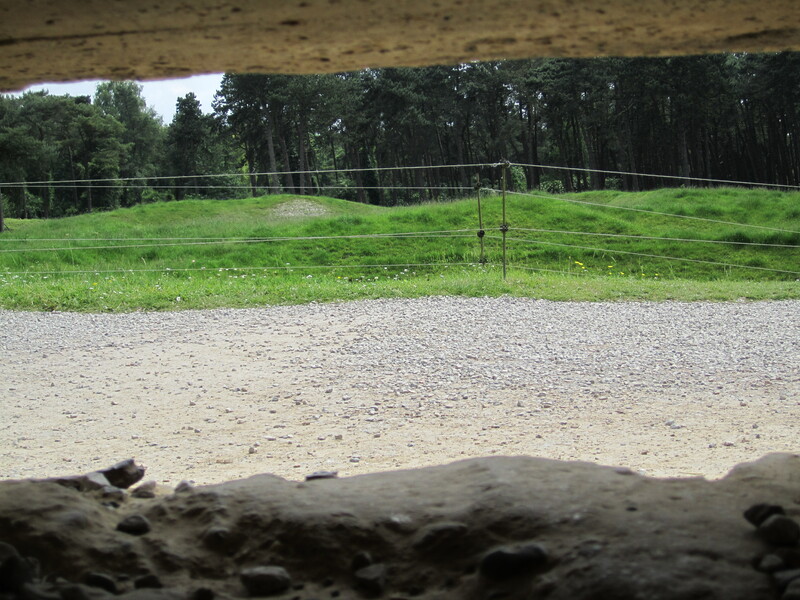 During that visit the guides turned off the lights to allow us to briefly experience in a limited way what the soldiers would have faced waiting for the battle to start. One minute I could see and the next moment it was pitch black, with only little lights punctuating the darkness. I knew my tour mates were with me only by the sounds of their breathing and their feet as they shifted their weight. The lights were only out briefly. Still, the experience provided me new insight into what it might have been like for soldiers, who like me, were mostly unused to being enclosed in a tunnel with people all around. 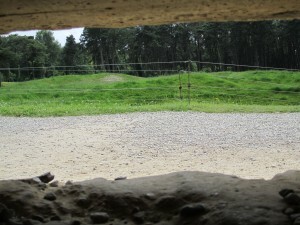 The scent that stays with me was from when I went into a pillbox that was part of the recreated trench system. It is hard to put the particular stench into words. The best way I can describe the smell is that it was a mixture of rotting vegetation and musty dank cellar. Entering the pillbox was made more challenging by trying to avoid stepping in a small pool of water on the dirt floor and not hitting my head on the narrow doorway and low ceiling. I was fortunate enough to be in there for only a few minutes and did not have to deal with the lice, rats, weeks of being able to not properly wash clothing or oneself that soldiers faced. Yet, the tunnel and trench experience made it easier for me to imagine what it was like. It gave me a deeper sense of connection to those who had walked there before me. Touching the cool stone of the pillbox was chilling in more ways than one. For a moment, I experienced a small measure of the hardships that they faced while they waited for battle. Nothing could have prepared me for the intensity of and range of emotions I felt almost in spite of myself as I visited the Canadian National Vimy Memorial Park. I had expected to be impressed, after all the memorial was designed to mark a battle that has overtime become a source of national pride. However, I had not expected to feel such deep sorrow that swelled up as I listened to Tyson tell us of the cost of the heroic action of 85th Battalion taking Hill 145. This battalion was a pioneer battalion that got called upon to take a hill and succeeded in taking the hill despite not being trained for that mission. I felt pride at what Canadians accomplished at Vimy as I listened, sitting on the steps with the stone of the monument against my back and the sun on my face. A sense of peace came from the fact that the park is simply beautiful. The baaing of the sheep that seemed to be at all the national sites only added to the picturesque and surreal nature of the site. It also reminded me how much has changed in the 90 plus years since the battle. I heard sheep, a father talking with his child where the soldiers would have heard gunfire, the groans of the injured and countless other sounds. Being a historian is often a solitary endeavour that takes place kilometres, years, decades or even centuries from what one studies. This trip demonstrated to me that I should not solely rely on documents written in my time period to connect with my research. A historian needs to visit the places he or she studies. I gained as much from seeing how much places had changed since it was recorded in paintings, photographs and other testimonies as I did from seeing how little the landscape had changed. For example, the recent nature of the houses spoke volumes of the destruction caused during the bombing of Caen in the Second World War. The massive craters at Pointe du Hoc, some of which I could not see over the top when standing at the bottom, brought home the tremendous power of the naval bombardment. I would like to take a moment to thank my fellow tour participants and our incredible guides, Colonel David Patterson, Dr. Marc Milner and Bobbi Milner. Being able to listen and learn from all of you added more than I can say. I want to thank you all for sharing your soldier stories, the laughs, the hugs, your thoughts, your support, and for making this truly a trip of a lifetime.